Through the years I have heard of a good deal of remedies for preventing tears when cutting onions. Many of these have been quite amusing; chew on a matchstick while cutting (must be wood), others sound as though they may work; run the onion under water for a few minutes before chopping and others sound just to weird to try at all;’with your swimming goggles firmly in place light the incense, put it alongside your chopping board and chop away’. For me the solution was discovered not by accepting old wives stories as fact but only by trial and error. You see when I was much younger and starting out working in kitchens and I would be given kilos and kilos of onions to slice, dice, julienne and chop by the head chef. With my young ambition I’d dive in and do exactly as he’d asked, standing at one chopping board for hours on end cutting nothing but onions. I quite enjoyed these sorts of menial tasks that many of my coworkers despised. They saw them as boring and un-educational. I on the other hand saw them as a challenge and an opportunity to improve my knife skills. I’d weigh the onions into equal weighted groups on each occasion and time myself to see if I was getting quicker. Occasionally I would get overly focused on my time and Chef would walk past and compare the inconsistencies in my pieces of julienne, he would say,”Hegeman, slow it down! This piece is 3 times the size of this one. I want them all to look like this one”, as he pointed to one of my few perfect pieces. I would agree,”Yes Chef” and begrudgingly pick up my knife again and cut the rest of the onions much slower. I digress, but what I’m getting at here is that I’d spend this time working vigorously slicing, cutting and chopping onions and never give another thought to tears. I had peeled the onions the same, I had exactly the identical plastic chopping board I was using the same knife as at work, (I always took my gear home with me on my days off). I couldn’t think why I would cry at home but not at work. Was there a sub-conscious part of me keeping my tears at bay for fear of tearing up facing Chef and the other guys at work? I couldn’t figure it out, but I was glad I never had much more than 1-2 onions to cut home. I later discovered it had nothing to do with what I was doing but what the kitchen itself was performing. You see at work there were 6 enormous extractor fans across from me, there was also a huge corridor running down to a huge entry door behind me that has been open to the fresh air. At home I had the windows in my apartment shut and the very small overhead fan turned away. So the answer I discovered is essentially ventilation. The next time you’re cutting onions, simply make sure you have good circulation; air being drawn in and out of the kitchen. Try to face or be as close as possible to your exhaust fan and open some doors and windows to permit the air to flow. If you do not have any windows close to your kitchen or your stove does not have an overhead fan, consider taking the chopping plank, the fresh air should have the same effect of circulation and dilute the fumes before they reach you. 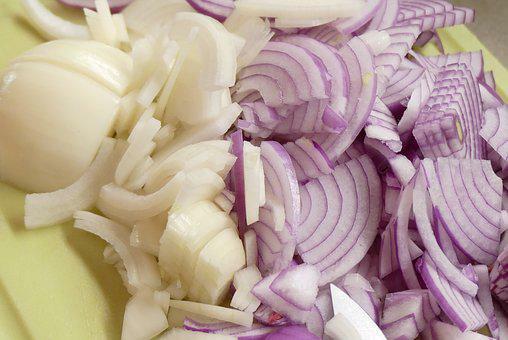 I have been working in commercial kitchens for many years and this simple method has kept me from shedding one onion tear. So next time you need to chop some onions, then leave the swimming goggles at the pool, the matchsticks in the drawer and just turn the fan on and open a window. Happy chopping.